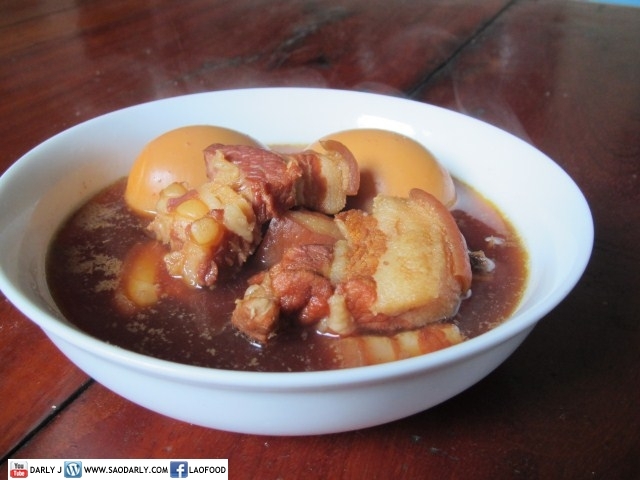 Tom Khem (Sweet Salted Pork Stew With Hard Boiled Eggs) for lunch in Vientiane, Laos. Aunt Phone has been making many dishes using pork meat since beef prices have not gone down last month. She makes Tom Khem once a week next to Larb Moo and Kaeng Moo. For this particular day, Aunt Phone made a big pot of the stew using 20 eggs. She told me on the phone that they ate the Sweet Salted Pork Stew With Hard Boiled Eggs for lunch and later for dinner with steamed white rice.